On 5 October 2014, Denmark's last train ferry was sunk in a controlled scuttling at the South Funen Archipelago, off the coast of Svendborg, Denmark. Now a popular dive site, the Ærøsund has been reborn as an artificial reef for the marine life beneath the waves. Located a few hundred metres from the shore, and at about 18 to 19 metres' depth, it is an easy spot to dive. There are large openings to dive through and two yellow buoys have been anchored to heavy iron chains to help divers find these openings. Incidentally, commercial ships are not allowed to get close to the site, so entering the wreck is easy. After the ship was submerged, divers regularly visited it to keep track of its “progress”. After six months, its appearance remained unchanged. The ballast was still in place and had not been washed away by the currents. This actually helped to stabilise the ship's upward position on the sandy ground. In June 2015, a steady growth of vegetation started to appear on the wreck. Then, in August, the wreck had become heavily overgrown, and some divers reported seeing plenty of fish during their morning dives. Today, the Ærøsund is completely covered with underwater vegetation, and is now a full-fledged artificial reef. The bottom of the wreck is now covered with mud and it is kind of difficult to swim through there, without stirring up a lot of dark silt. 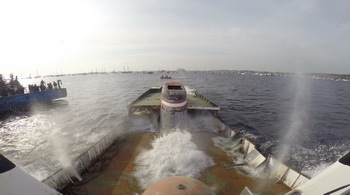 It is not dangerous though - as it is easy to find out of the wreck, so you just need to keep calm if you go down there. Also in some of the below rooms there are silt layers on the bottom. 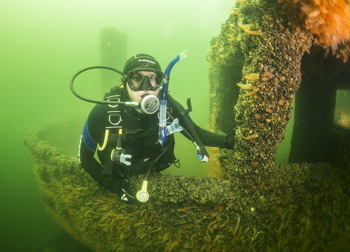 Several dive centres in the vicinity offer dive trips to the Ærøsund. The nearest one is Diving 2000 in Odense (www.diving2000.dk); it offers dive trips all year round, and not just to the Ærøsund, but nearby wrecks as well (though these may be challenging to dive due to the strong currents). In fact, a little more than an hour away is a popular dive site for many Germans: the Little Belt between Funen and Jutland. Twice a day, the current turns, making it one of the best dive sites in Denmark. Many Germans dive there regularly on weekends as it is always possible to find shelter. There is even a large area specially fenced off for diving, and several dive sites here have large stones that serve as artificial reefs. More details about diving at the Little Belt can be found at www.divingdenmark.com.